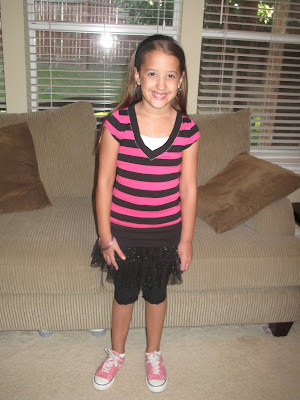 Silly Mommy : Happy 8th Birthday Aubrey! 8 years ago today, our first child was born-Miss Aubrey Ann! She has been a wonderful blessing in our lives from the moment we knew she would join our family and make Joey and I parents. So smart, so sweet, so thoughtful(always thinks of others feelings, always! ), a good example, a great teacher, a wonderful friend, super silly, super cuddly(always wants to lay on the couch with me after school:), helpful, loving, funny, the list could go on. 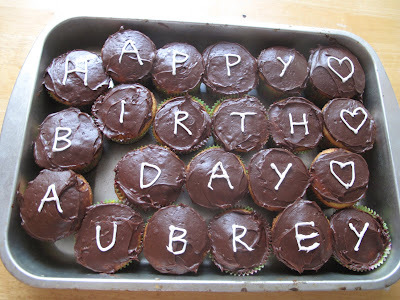 We love you Aubrey and hope you have a wonderful birthday today-we will make it the best we can! So far, we've let her choose breakfast(donuts from the donut shop around the corner-yummm).We also let her open two small presents this morning before school, hoop earrings(she has been wanting these-she thinks they look "grown up" :) and a set of bracelets. She was excited to wear them along with her favorite outfit today. Here are the cupcakes I made for her to share with her classmates. There are a lot of rules about no sprinkles/candy, otherwise I would've totally sprinkled them out. I decided to write on them and put a hershey kiss in the middle of each one for a little surprise. The kids enjoyed them! Can't wait to hear what restaurant you pick out for dinner Aubrey! And Mommy won't mind if its Mexican food:) Kidding!! She gets to have a friend party next weekend at a gymnastics place and is really excited. She has a lot to look forward to in the next week and a half! Happy happy birthday to Miss Aubrey! Wish we could be there to help celebrate! Happy birthday you beautiful little one! Sounds like a great partay your gonna have! Happy Birthday! I love the cupcakes! Those cupcakes sound so yummy! And I love the new earrings and bracelets- she does look all grown up. :) Happy Birthday again, Aubrey Ann. Love you! Happy Birthday Aubrey Dear!! She is a beautiful girl. Enjoy being 8 and your journey!! !